Over the past few months i’ve continuously highlighted the growing trend for buyers choosing condos over single family homes. The desire for Vancouver condos continues to grossly outpace single family homes, for obvious reasons, affordability. 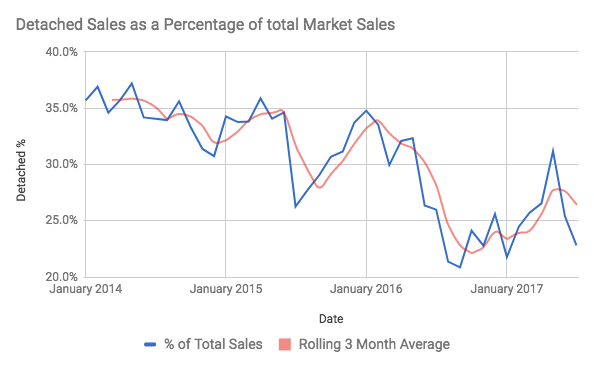 Single family homes as a percentage of total market sales dropped to 22.8% in July, 2017. 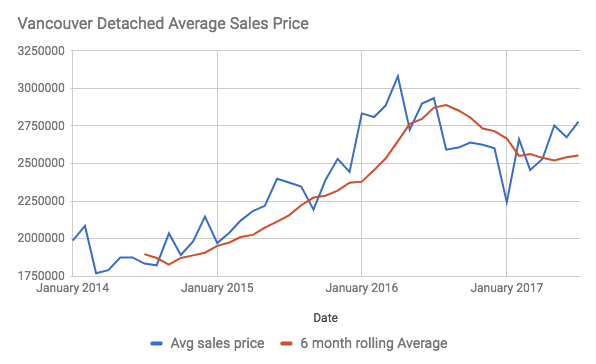 In simpler terms, for every 100 sales in Vancouver, roughly 23 are detached homes. This number has been steadily dropping since it peaked in January 2016 at 34.8%. 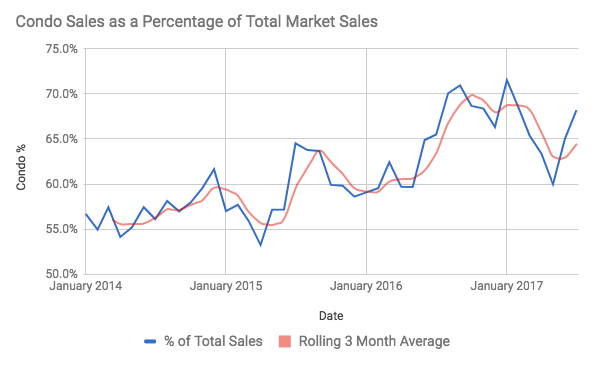 Detached home sales as a percentage of total sales mix continues to fall. With the detached housing market peaking in early 2016, for various reasons, the sales mix began to shift towards condos. The share of sales for Vancouver condos increased from 59.1% in January 2016 to 68.2% in July, 2017. Demand for Condos continues to grow relative to total Vancouver sales. I expect this trend to continue as the PBOC remains serious about controlling capital outflows. With the average single family home out of reach for the majority of locals, prices appear to be inching downwards, and as of July, 2017 have dropped 5% year over year. Previous articleDid The Vancouver Foreign Buyers Tax Work?